Enrollment verifications are available instantly, 24 hours a day, by logging in to BannerStudent and selecting the "Verify My Enrollment" link. All your enrollment information on file with the Clearinghouse. Student loan deferment notifications sent to your loan holders by the Clearinghouse. Proofs of enrollment the Clearinghouse has provided to your health insurers and other providers of student discounts. Contact information about your lenders. 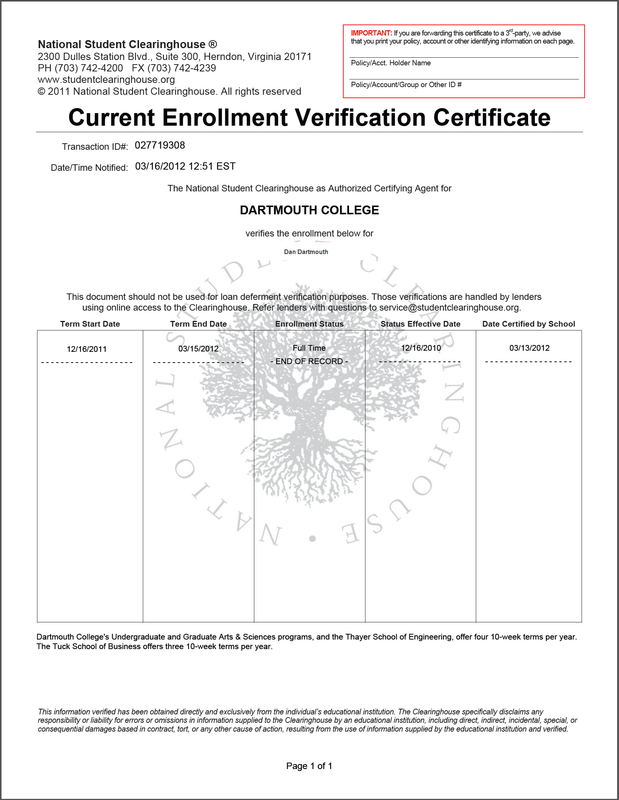 An enrollment verification is a document that officially verifies that you are enrolled at Dartmouth College. Various agencies and organizations often require that you provide this information for insurance coverage, loans, study away, ski passes, athletic participation, etc. No, Dartmouth College offers this service free of charge to students in partnership with the National Student Clearinghouse. Students may obtain an enrollment verifications online 24 hours a day, 7 days a week by logging into BannerStudent. Most U.S. institutions provide their current enrollment and graduation data to the Clearinghouse. The Clearinghouse acts as their agent providing deferment information for financial aid students to the education finance industry and Department of Education. In addition, it provides certain additional services which institutions may utilize such as self-service enrollment verification. What information is on an enrollment verification form? Verification forms include your name, enrollment status, and the valid dates of that status. Do enrollment verification forms include any academic information such as GPA? No, these forms do not include GPA. If you require academic information, such as a "good student discount," you must request an official transcript. Will an enrollment verification provide proof of enrollment for the entire upcoming school year? No, the form will not verify future terms. It will only verify enrollment for the term(s) in which you have been or currently are enrolled (registered for courses). I am a new student who has not yet registered for classes. Can I provide proof of enrollment to my insurance company? No, not yet. Once you are enrolled in courses, you may request an enrollment verification. My insurance company provided a form to fill out. Do I have to use that one? No, you may print the online enrollment verification form and attach it to the form the insurance company has provided. This is typically accepted by most agencies. My insurance company asked for policy and account information on the form. How can I provide that? The form includes a space at the top where you may enter policy/account information; see the sample image. Are electronic enrollment verifications available to all students? No, if a student does not have a Social Security Number recorded in Banner, we are unable to provide an electronic enrollment verification. Please contact the Registrar to obtain a paper form at registrar@thayer.dartmouth.edu or call (603) 646-3801.